When I was just three months old, I had a heart transplant and, though I don’t remember it, I still struggle with the side affects every day, whether it’s by taking medicine or going to the hospital for lab work or heart catherizations. I also have severe food and environmental allergies, and I have been rushed to the emergency room multiple times because of anaphylactic shock. When I was around seven years old, I had a severe reaction to some of the topical medications that I was using during that time. I was completely unrecognizable and I looked like a burn victim. My face was covered in scabs and would constantly bleed and ooze. The day when my mom kindly took down all the mirrors, is sketched in my mind; I was horrified to even look at myself, and, sometimes, I even wanted to die because I was afraid of getting worse. 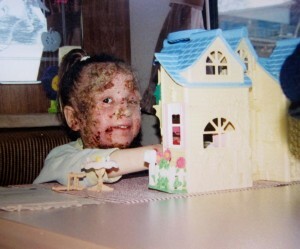 I also remember when my skin DID continue to get worse, and I couldn’t see or eat anything. I worked to just get my mouth open enough to drink fluids, and I was proud of myself when I was able to. It was during those times that I FELT like God wasn’t there for me. My days were long and my nights were miserable! Sometimes, I would hardly sleep at all, but when that happened my mom would rock me (with my stuffed animal, Scottie!) and turn on my favorite CD. God spoke to me through the music and the words. He would whisper, “I love you, Daughter. I died for you because of My love for you, and I will help you through this valley.” Then I would picture Jesus taking my hand and walking through the darkness of the night with me. I would drift off to sleep and wake up with a renewed joy and the warm sun shining on my face and I knew it was finally another morning. Me while suffering from extreme skin issues. Over the next few years of my life, I got much better. My skin healed and, surprisingly, didn’t leave any scars. Surrounded by the love of my two wonderful parents, siblings and friends, I couldn’t ask for a more blessed life. Some wonderful people got together and built a special house that I could live in and not react to all the things I was allergic to. Three weeks after we moved in, I could take a bath and actually enjoy it! Before this time, I would scream or cry because of the way that plain water would burn my skin! It was such a miracle! During those horrible times, my mom remembers me praying a prayer something like this, “Dear God, You and I are like two frozen peas stuck together and NOTHING is EVER going to separate us! Satan, you need to leave us ALONE! God gave me joy in the midst of my sickness. 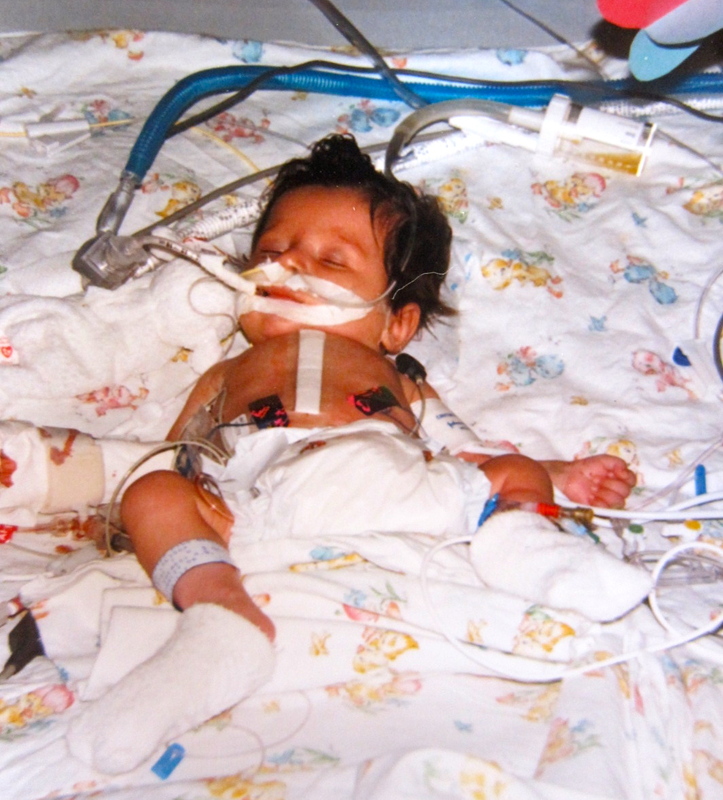 Around the end of October, in 2010, the CMV virus became extremely active in Austin’s body, and then he also contracted a bacterial infection. His white blood cell count was knocked all the way down to zero. When he picked up a common cold, it took his life very suddenly. Our family now faced the most difficult part of our journey so far. Only the people who have lost a loved one can fully understand the feelings of pain, suffering, and the grieving that we, as a family, have went through. I had always struggled with lots of fear regarding the future, and the fear of dying. But about two weeks after Austin’s funeral, I realized that rather than God taking Austin away from me and just letting me “fend for myself” without Austin to help me, He was actually letting Austin go ahead of me one last time to show me that there is no need to be afraid of death. Even during that extremely difficult time in my life, God was there. He was carrying me and crying right along with me. Just like in the poem, “Footprints in the Sand,” I only saw one set of footprints, and I blamed God for taking my one and only brother and my best friend. your giants away, but He’s your Father and Friend. One who wants to help you through those dark nights. When you look back on these hard times, and you see only one set of foot prints, you will know that God was there for you also. Since all of this has happened, my mom has written two books. We have continued to sing about giving the pain we have, whether it is emotional or physical, to Jesus. He is the one and only “Heart Healer”. We sing another song, by Laura Story, that I really like: “When I’m at the point of breaking, at the place where I resign, when I’m at the stage of shaking my head as I look back on my life, when I’m half way through the grieving, but not quite through the ache, when I cannot see the ending, or which road I’m supposed to take… All I know to do is lift my hands to You. Take all of my life, all of my life, and make something beautiful. I open my hand, trusting Your plan to make something beautiful, so all will see Your work in me as You make something beautiful.” This truly is my prayer for the rest of my life! Let God make something beautiful out of your life as you trust Him during your trials. Wow, very well written story! God has brought you so far! Nicely done Alisha, beautiful spirit. beautifully written, God be praised, Go for GOD Alisha, you hav a wonderful family. beautifully written, Go for GOD Alisha, u hav a wonderful family! Thank you for sharing with us,Alisha. You are an encouragement to us all. God bless you as you continue ta minister to Him. Thanks for sharing your story so openly and candidly. I love the ‘frozen pea’ description!! What a great picture of sticking together with God! Many blessings to you and your family. Beautiful and awesome Alisha! Your story and you! God bless you. The strength and courage you’ve written about is amazing, but then it should not be surprising because it is clear God’s strength and courage is showing through you. You are truly a light to others. Today at church our pastor talked about having joy and praising through the trial and now I read this such an example of having joy and praising through the trial. May God continue to bless you and keep his arms wrapped lovingly around you. You have inspired me. Thank you Alisha.You were such a blessing to us here in Rosenort MB together with your Family through your songs and testimonies.Thank you again! So good, Alisha!! Sometimes we forget how much you’ve gone thru!! You’re a brave girl! You truly have a beautiful spirit! The skin issues….almost had forgotten how you struggled with that! So glad for the healing power of God on your life! Love you, Girl!! Alisha I love you and we pray for you daily. Keep looking to Jesus, He can keep you well and beautiful. Well written.. Alisha!!! was very touching and I really am touched every time your family sings those two songs. May God bless your life and your family as you minister to those hurting in prisons and in other areas as well!!! Praying for your family!!! Hey…I am amazed at your testimony.You are so strong and confident.Keep on keeping on. Also….I had seizures at 10 years old.I am very familiar with all the “procedures.I am no longer having seizures..I had childhood epilepsy. —I have gone, you have gone, he has gone, we have gone, you(plural) have gone, they have gone. Much success as a writer as well as a singer! I found your blog and I just wanted to tell you how much I appreciate your ministry. Alisha, this is so beautiful. What an amazing story of healing and hope you have. God has a plan for you and it is good! Your testimony is inspiring. God bless you all as your continue sharing about the joy God has given you inspire of pain. And as a side note, we so enjoyed the evening at Freedom Hills Banquet with you. Thank you for being used of God. Blessings! very much and I think the best part was both getting to hear testimonies, as well as meet new friends such as yourself. Thanks again for the encouragement and may He richly bless you!